In the end, the primary focus of space missions is not the excitement, adventure, or challenge of designing and launching spacecraft: it is the scientific data they return to us, and the information scientists draw from this data. 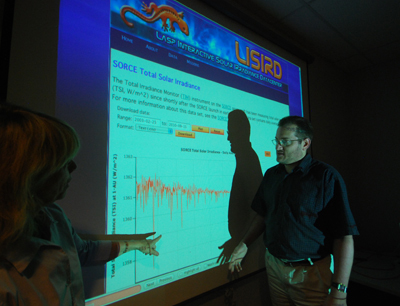 Software engineers and data analysts in the LASP Data Systems team serve at the interface between software and science, focusing on the development of data systems that generate, display, and disseminate scientific data products. Scientists around the world then use these high-quality data products to further scientific understanding of atmospheric and space science. LASP’s Data Systems group maintains expertise in all facets of data systems development: numerical analysis, algorithms, programming techniques and methodologies, data management and analysis, data system design, and software project management. Our emphasis is on developing and maintaining large-scale, robust data systems.